Cold weather and I do not go well together. Don’t get me wrong, I love the autumn and winter months however I hate how cold it can get especially in my house, even with the heating on for some reason my house just stays extremely chilly to the point where I sometimes where gloves around the house. 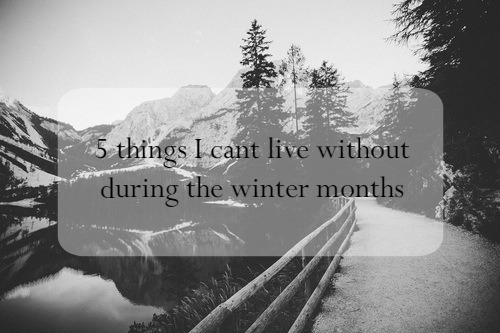 I have put together 5 things which I cannot live without during the winter months to keep me snuggly and content. Who doesn’t love those amazingly soft, fluffy Primark socks? I pretty much wear them all year round however I find myself buying more & more pairs around this time of year. I hate having cold feet as it just makes the rest of my body feel even colder therefore these are pretty much essential to me when it comes to winter. I’m not a coffee drinker so I practically live on teas and hot chocolates. I feel as if there’s nothing better than snuggling up in your pyjamas with a good ol’ hot chocolate. I also love a good classic English tea in the mornings to get my day off to a good start however recently I’ve been loving Green/Herbal Teas which have so many great benefits to your body. I have been enjoying the Clipper Organic White Peppermint tea at the moment and I’d highly recommend it. Now my skin gets a lot drying during the colder months therefore moisturiser is a necessity for me. 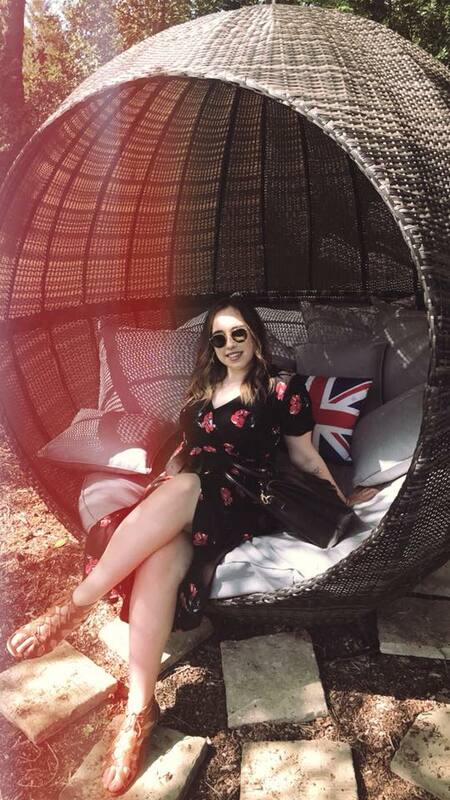 I’ve been using a mixture of Clinique Dramatically Different Moisturising gel and NUXE Crème Moisturiser for my face and then for my body I like using either Zoella Double Crème body lotion or any of the body shops body butters. It’s very important to keep your skin hydrated during this time of year so stock up those moisturisers! I have recently realised my obsession for buying new jumpers has become a little crazy over the past few weeks. No word of a lie, I’m pretty sure I’ve bought over 10 new jumpers within two weeks but it’s okay because you can never have too many jumpers. I love lounging around the house on cold days wearing an over-sized jumper, it makes me feel so snuggly and warm. Also can I just point out how amazing the Primark jumpers are this year? I think I own every single one in every single colour (bit of an exaggeration but we’ll go with it). I am a candle junkie and this may sounds stupid to some, but I much prefer to burn them around this time of the year. I have about 3 candles that I bought months ago yet I’ve only just started burning them. I feel like they make the house a cosier place plus they smell good. I lean towards the cinnamon and peppermint smells as it reminds me of Christmas and the New Year!! What are the things that you can’t live without during winter? My box arrived just in time as I was in need of a new eyeliner. 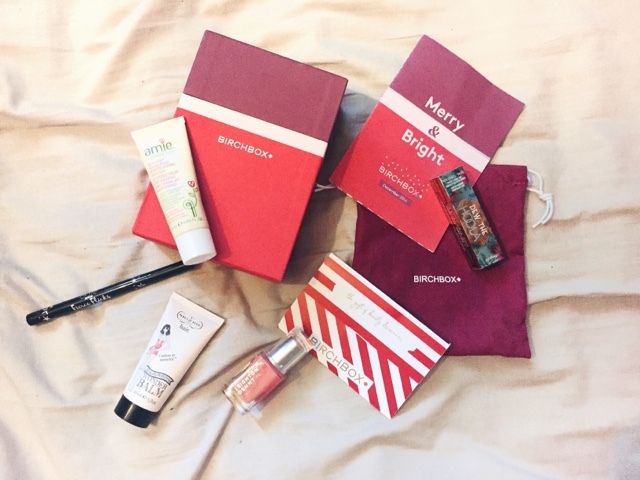 Everyone that's subscribed to Birchbox all received a full size Ciate London Fierce Flicks Eyeliner which would normally retail for £15! This felt tip liner has a super black formula and precision tip which makes it easier for people to apply a feline flick. I've been using this every day since I received it and it managed to last throughout the whole day without any smudging. I was extremely excited when I saw this in my box this month as I've been wanting to try out this product ever since Benefit released it. It's essentially a liquid bronzer which melts into your skin for a naturally sun-kissed look. What I love most about this product is that it's completely matte and free of any shimmer, I don't really like shimmer bronzers much on myself therefore I tend to lean more towards mattes. This product is super easy to use, you only need the tiniest amount of product. Simply blend this in using your fingers over your cheeks for a natural bronzed look. You can use this over or under foundation. This full size nail polish I received is such a gorgeous colour. A soft baby pink which I think is perfect to wear over the New Year! It has a long lasting, chip resistant and easy to apply formula. I found that you need at least two coats for the full colour effect. That's a whopper of a title isn't it? I wasn't too sure about what this product is meant to do at first but after doing a bit of research it's a balm that you smooth into your damp hair after you wash it. It claims to moisturise, boost shine, smooth, soften, protect and speed up styling (phew!). I used this on my hair the other day and I haven't noticed much of a difference yet but I'll continue to use this after each wash to see if it makes any difference to my strands. This product is by far my favourite one I have received this month. It's a completely natural face exfoliator which smooths skin with its deep cleansing treatment. It uses rice granules to gently lift away dirt and impurities from your pores. Take the smallest amount and massage into damp skin using circular motions then rinse away with warm water. My skin instantly feels soft, smooth and refreshed afterwards. Only use this product once or twice a week. What product do you like the look of most? If I could go back in time and change one thing about my hair, it would be to never dye it. I had pretty normal/healthy hair up until the age of 14 when I discovered hair dye and decided to dye it a ton of different colours. What started off as dark brown turned into bright red. If you've dyed your hair red before then you'll understand when I say how it's an absolute pain to get rid of. I had to strip my hair and then use semi permanent brown dye, yet even that didn't remove it completely. For the past 2 years (nearly) I have been hair dye free and I've let it grow out back to my natural colour. I still have a tiny bit of red tinge to the ends of my hair but it's not that noticeable. So, as you can imagine I have been dealing with dry/damaged hair for a good few years. The condition of it is much better nowadays ever since I've stopped dying it, it's definitely not the healthiest but it's better than what it used to be like. I also do a few extra things to my hair which help with the dryness. 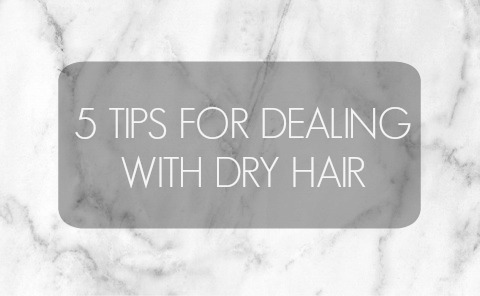 I have put together a few tips on how to deal with dry hair and what type of products I use to help hydrate and nourish those nasty dry strands. This has to be on the top of my list because it has honestly made such a difference to my hair. The vitamins and fatty acids which are naturally found in the oil help to nourish the scalp and remove build up from the hair follicles. It overall makes your hair feel so soft and hydrated after each use. I normally treat my hair with coconut oil once a week. I take a generous scoop of it and warm the oil up with my hands so that it becomes a liquid, then I'll apply it on every single strand (yes, even on my scalp). I then tie my hair up into a bun and wrap it with clingfilm to lock in the heat. I'll either leave this in for 2-3 hours if I'm not doing anything for the day or I'll apply it before I go to bed and I'll sleep with it on then wash it out in the morning. I shampoo twice as I feel like once isn't enough to get it all out and I use a very small amount of conditioners just on my ends. I did this all the time until I found out that it's actually extremely damaging to wash your hair every single day because it strips your hair of any natural oils which are being produced. Try washing your hair every other day or even every 3 days if your hair can handle that. I personally only wash my hair twice a week, I know it sounds disgusting but I'm quite lucky as my hair doesn't start to get greasy until after the 3rd or 4th day. Also, washing your hair less will actually help it to not get so greasy really quickly in the future. Dryness can also be due to dehydration. Water has so many benefits for your hair, skin and nails that it's so important you're getting a good water intake each day. Not going to lie but I am simply the worst when it comes to drinking water as I'd much prefer a glass of Coke or Lemonade and that's OK. Have them in moderation! Start off with drinking flavored water which is obviously a bit more exciting, then move onto regular water. It honestly improves the condition of your hair so much. Green tea is also a great substitute. I've been straightening/curling my hair since the age of 13 and back then I didn't know what a heat defense spray was so I never used it. I also always blow dried my hair after every wash, then I would go right for the hair straighteners without protecting my locks. I'm not saying you shouldn't use styling tools I mean, I use them most days. I'm saying try to cut down on the heat as much as you possibly can by using heat protectors. I've managed to not use hair dryers anymore as they just make my strands dry as f*&k! I like to let my hair air dry and only style the pieces that need it the most. It may sound a bit weird but it's one little step that I take to help with the dryness. I don't to use a towel to dry my hair with as it's a rough texture which means that it damages your hair making it even more dry. I like a use a old T-Shirt when patting my hair dry as it's a lot more softer and gentle on each strand. It's a bit weird and abnormal at first but it does a world of a difference. Do you have any tips that I haven't mentioned? I'd love to know!